With the environment becoming a major concern, environmental studies and eco-friendly initiatives have been launched worldwide to locate problem factors and find constructive solutions. One important attention grabber over recent years is plastic. 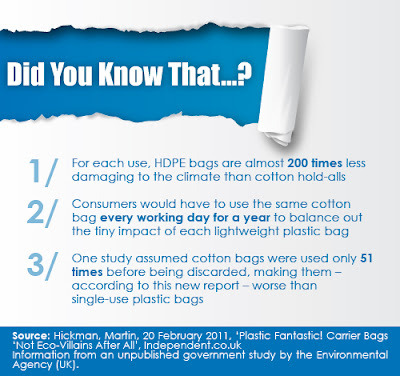 This article sheds some light on the benefits of plastic. With the growing population and increased demand for food products, a lot of attention and scrutiny is placed on safe transport of food products and reduction of spoilage. A key focal point of packaging is to preserve, protect, and elongate the life of food products. Plastic provides an efficient source for packaging, offering flexibility, durability, strength and light-weighting opportunities. Plastic packaging materials are resource-efficient and provide opportunities to minimize packaging use, thus decrease package weight (light-weighting). In doing so, energy consumption and greenhouse gas emissions are cut down, as well as lower costs for consumers. Although minimizing resources, plastic packaging maintains functionality and effectiveness. Plastic packs are durable, anti-break, and protect food products from contamination. 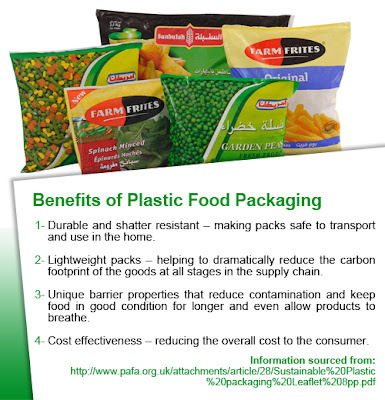 Furthermore, plastic packaging maintains food moisture and freshness, as well as greatly extends product life. By decreasing spoilage, food waste is immensely minimized. This is good for the environment since the carbon footprint of packaging is minimal in comparison to the energy and resources used to produce the food product. Additionally, plastic packaging offers flexible and adaptable design options. For products that will not be consumed all at once or will be consumed according to a specific portion, plastic packaging solutions, such as portion packs, re-sealable film packs, and blister packs (for candy, medicine, and pharmaceutical products), enable consumers to use exactly the amount they need without ruining the rest of the product.